Enter the name of the Event/Membership you are creating. I.E. Party on the Range, Ladies Nine & Wine, etc. Click the blue calendar icon to choose your event date. The earliest you can create an Event/Membership is 58 days prior to the Event/Membership date. 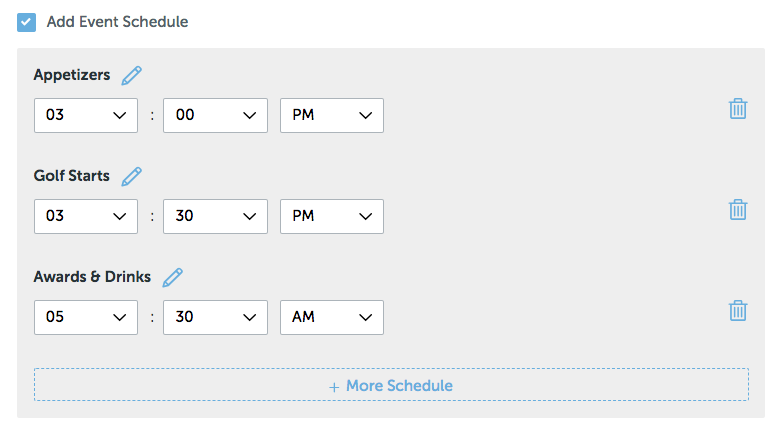 Check the box next to Add Event Schedule to add more detail to the day's events. For example, you may want to state that appetizers will be served at 3:00 PM, golf starts at 3:30 PM and awards and drinks are served at 5:30 PM. Choose the pencil next to the default name of the event to enter and update the title of that event, then update the hour, minute, and AM/PM for the associated event. To add additional events to the schedule, simply click the + More Schedule link. Choose the start and end date for your membership. The start date you choose must be within 58 days of the creation date. The end date must be within 1 year of the creation date. 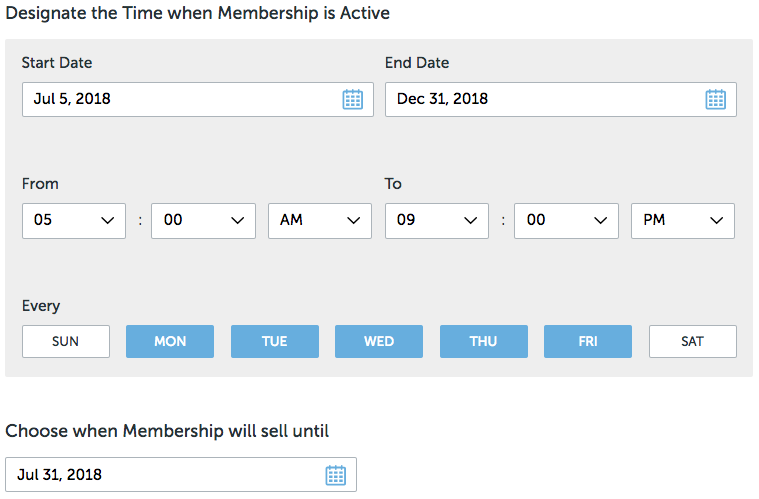 Choose the time of day that your membership will be active. For example, if you were creating a twilight golf membership, you may choose FROM 2:00 PM and TO 9:00 PM. *NOTE: A membership time frame must be a minimum of 1 hour. Choose the day(s) that the membership will be active. For example, if this is a weekday membership, you'll choose Mon-Fri. Membership will sell until when? You may wish to restrict when users can register for your membership. For example, you may be creating a summer membership that begins on June 1, and you may want to stop all membership sales on May 31. Enter the Club name of the golf facility that this Event/Membership will take place at. (Optional) Add a specific location at the club, i.e. Driving Range, Clubhouse, Etc. Note: When setting up an Event, you will be able to choose any golf facility available in the 18Birdies database, but when setting up a Membership you will only be able to choose a club that is currently connected to your 18Birdies for Business account. 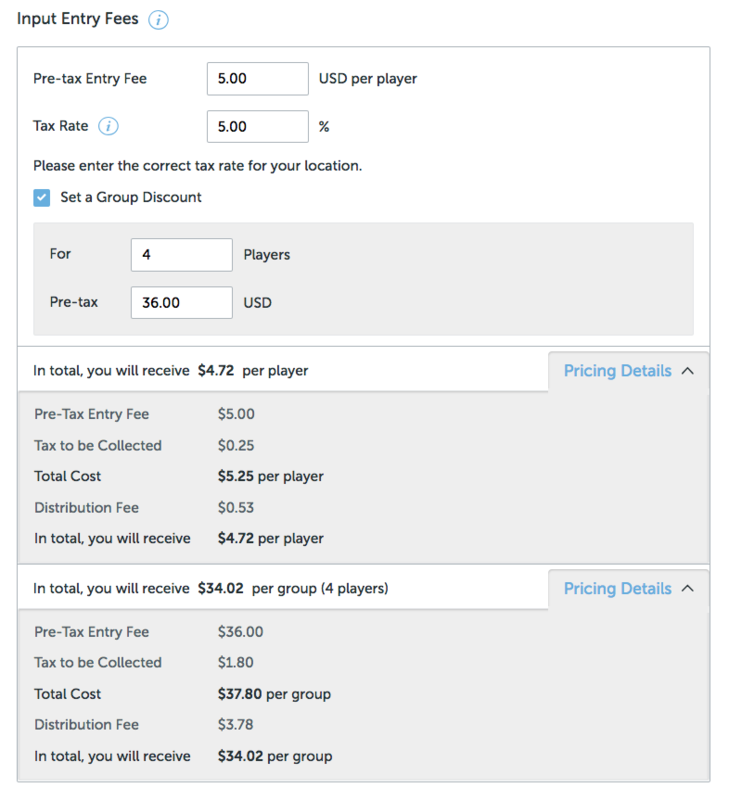 Choose the Pricing Details drop-down menu to view what app users will see when they register for your event. This will show you what the Total Cost will be to each registrant, as well as what you will receive after the distribution fee is collected. When you're ready to move on, click Next.